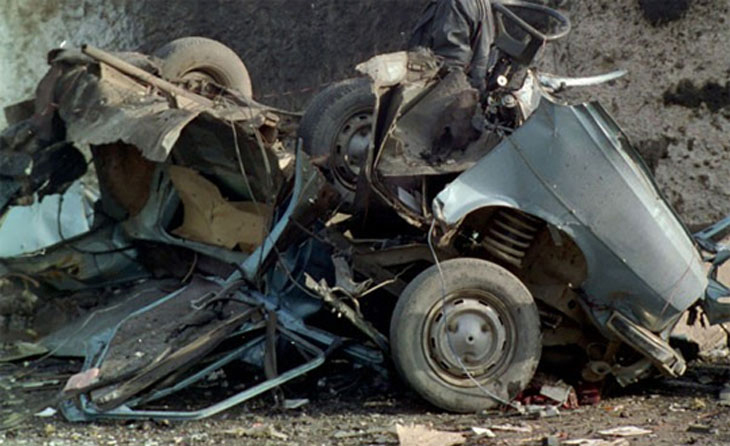 The Investigation of Uğur Mumcu’ murder, whom we lost in a bomb attack in front of his home on January 24, 1993, has passed through various stages. From the beginning, The Prosecution ofthe State Security Courttook the action on the case. Nevertheless, the case file had never been completed. After a long time, like 7 years, the lawsuit was sued with the name of “The Hope Trial” on July 11, 2000. Within that period of 7 years, several troubles occurred in the investigation. Uğur Mumcu’s wife Güldal Mumcu and siblings Beyhan Gürson and Ceyhan Mumcu had many attempts in order to accelerate the investigation process. Güldal Mumcu stated that there were some malpractices related to investigation. She claimed that the investigating Prosecutor of the State Security Court Ülkü Coşkun, who said, “it was committed by the state and can only be unravelled when the political power wants it so” had laid down the case, and she submitted petitions underlining those omissions. Upon Güldal Mumcu’s petition –submitted to the Ministry of Justice in 1994- claiming that Prosecutor of the State Security Court Ülkü Coşkunhad laid down the case, The Ministry of Justice issued an order of investigation to its inspectors. In the report they prepared following their investigation, the inspectors of the Ministry of Justice reached the conclusion that Ülkü Coşkun had laid down the case and reached the verdict that a disciplinary punishment had to be inflicted. However, since Ülkü Coşkun was a member of military and the Ministry of Defence determined his employee personal rights, it had to be the Ministry who implement the decision. Nevertheless, the Ministry of Defence did not implement the decision, decided that there was no ground for investigation, and cancelled the case file. Thereupon, we filed a lawsuit in the Military Government Court with the appeal for the implementation of disciplinary punishment for Ülkü Coşkun. In the end of the trial, the Court decided not to implement the decision and did not declare the reason behind it since it was a state secret. Güldal Mumcu, her children Özgür Mumcu and Özge Mumcu, brought an action against the Ministry of Internal Affairs for the compensation of their pecuniary losses and intangible damages because the Ministry did not discharge its responsibility by not protecting Uğur Mumcu properly, not at all. They won the case. On January 14, 1997, Parliamentary Investigation Commission for Uğur Mumcu’s Murder was established and the Commission finished its duty on June 4, 1997. For the important detections in the result part of the Commission’s Report dated June 4, 1997, please click. After the criminal complaints filed by Parliamentary Investigation Commission for Uğur Mumcu’s Murder and the petition submitted by Uğur Mumcu’s wife and siblings to the Ministry of Internal Affairs in 1999, the Ministry instructed the authorities of crime scene investigation team to re-examine their investigation. All those attempts had led to the start of The Operation of Hope; the indictment was filed and in 2000, the lawsuit was opened in the State Security Court No. 2. The Court upheld the decision for some defendants, while reversing it for others and the file turned back to the State Security Court No. 2 eventually. In line with the reversal of judgement, the case continued in the same court with file no. 2002/139. -With respect to Abbas GULAMZADE’s murder, merging the case file with the pending case no. 1993/205 E. in İstanbul State Security Court No. 3 or investigating the result and deciding accordingly. The Domestic Court abided by the reversal of judgement and has been conducting the trial since 2002/139 E.
-In the hearing dated 16.04.2003, Ferhat Özmen and Gülay Çalap who used to work in the courier company before the incident confronted. The witness declared that, it was impossible to recognize because of the long time that had passed. …ask the Ministry of Internal Affairs whether the requesting defendants could benefit from the law no. 4959 or not. The Court decided to wait for merging this file with the one sent from İstanbul State Security Court No.3 and adjourned the hearing until 17.03.2004. -inform the Ministry of Internal Affairs about the requests of Hasan KILIÇ –defendant no 1- and Ekrem Baytap – the defendant of the merged file- in order to benefit from law no. 4959, and request a report to be prepared. -to wait for the answers of warrants written regarding the requests of the other defendants, and adjourned the hearing until 26.04.2004. The document regarding the negative answer of Ministry of Internal Affairs to the requests of defendants Mehmet Şahin, Fatih Aydın, Mehmet Ali Tekin, Yusuf Karakuş, Muzaffer Dağdeviren, in order to benefit from the law no 4959 was read. Nothing significant happened; the Court decided to adjourn the hearing until 07.07.2004. Since State Security Courts Law no. 2845 was repealed with the law no. 5190, the case file was transferred to the newly established Ankara 11thHigh Penal Court and the suit was filed by this court. Thereby, the Court and the Prosecutor responsible for the case file had changed again. The court adjourned the hearing until 04.08.2004 by deciding to wait for the answers from the Ministry. The documents coming from the Ministry of Internal Affairs stating that Hasan Kılıç and Ekrem Baytap could not benefit from the law of decarceration were read. The defence attorneys were given extra time to make their counter statements and the hearing was adjourned until 20.09.2004. Defendant Ferhan ÖZMEN entered into discussion with the Court while his attorney was giving his defense statement. Restarting the hearing after a break, The Court warned Ferhat Özmen’s attorney and stated that the due proceedings will be done with regards to Penal Procedure Law 394/d. Defendant Ekrem Baytap’s attorneys requested additional time for defence, while defendant Hasan Kılıç’s attorney did not appear in the hearing by submitting an essoin. The Court decided for the continuation of detention of the detained defendants Hasan KILIÇ, Ferhan ÖZMEN, Mehmet Ali TEKİN and Ekrem BAYTAP, and adjourned the hearing until 14.02.2005, 10 a.m. for the inspection of their detention. In the inspection dated 14.01.2005, the Court decided for the continuation of detention. No significant development had occurred, since the effective date of the new penal code was awaited. The Prosecution read their opinion as to the accusations. Accordingly the Prosecutor requested that defendants Ekrem BAYTAP and Ferhan ÖZMEN be convicted by Turkish Penal Code (TCK) no. 765 (former law) articles 146/1 31,33,40; the defendants Mehmet Ali TEKİN and Hasan KILIÇ be convicted by Turkish Penal Code (TCK) no. 5237 (new law) articles 314/1 and Law No 3713 articles 5, 52, and 63; Abdülhamit ÇELİK, Muzaffer DAĞDEVİREN, Fatih ALGÜN, Yusuf KARAKUŞ and Mehmet ŞAHİN be convicted by Turkish Penal Code (TCK) no. 5237 articles 314/2, 53, 63 and Law No. 3713 article 5; defendant Yusuf KARAKUŞ and Muzaffer DAĞDEVİREN’s probations be reversed; driving licences of defendants Ferhat ÖZMEN, Hasan KILIÇ and Abdülhamit ÇELİK be taken away and those defendants’ requests for benefiting from law no. 4959 (decarceration/repentance law) be refused. Among the attorneys of defendants; Ekrem BAYTAP’s attorney requested additional time for defence; attorneys of Mehmet ŞAHİN, Mehmet Ali TEKİN, Hasan KILIÇ and Ferhan ÖZMEN gave their defences as to the accusations. The Court granted an extension to Hasan KILIÇ Mehmet Ali TEKİN and Ekrem BAYTAP’s attorneys for giving their defences as to the accusations and adjourned the hearing until 01.07.2005. Attorneys of the defendants Hasan KILIÇ, Mehmet Ali TEKİN and Ekrem BAYTAP gave their defences as to the accusations. The Court took the case file under inspection and adjourned the hearing until 28.07.2005, 10.30 am. In that hearing, the Prosecution stated that they repeat their opinion as to the accusations. The Court asked for our opinion as the intervening party. Stating our agreement with the Prosecution’s opinion, we indicated that “unless the forces that organized the murders of our relatives Uğur Mumcu, Muammer Aksoy, Bahriye Üçok and Ahmet Taner Kışlalı are also revealed and put on trial, the file case will not be closed for us-the resigned ones- and the public conscience will not be satisfied either”. After hearing the final words of the defendants, the Court decided 1-to separate the file of the fugitive defendant Oğuz Demir; 2-that Ferhat Özmen be sentenced to aggravated life imprisonment by (former) Turkish Penal Code 146/1 and did not abate the sentence; 3-that Hasan Kılıç and Mehmet Ali Tekin be sentenced to prison terms of 10 years by (new) Turkish Penal Code 314/1 for “being a specially authorized director in an armed organization”. After applying the articles of penalty increase and reemission and giving a prison sentence of 12 years and 6 months, the Court finally decided to sentence them to 6 years and 3 months prison term and release after applying the article no. 4/C-2 of law no. 4959 (repentance law); 4- that Mehmet ŞAHİN, Fatih AYDIN, Muzaffer DAĞDEVİREN and Abdülhamit ÇELİK be sentenced to 5 years of prison for “membership to an armed organization” by new Turkish Penal Code article no.314/2. The prison sentence became 7 years and 6 months after the articles on penalty increase and reemission and the article no.4/C-2 of the law no. 4959 applied, the Court decided to sentence the defendants to 3 years, 6 months and 15 days of prison; 5- that Yusuf Karakuş be sentenced by article no. 314/2, and after the articles on penalty increase and reemission applied, availing him of article no. 4/C-2 of law no.4959, the Court finally sentenced him to 3 years and 9 months of prison. Also, since he was released on parole for an early prison sentence of 30 years he had, the probation decision was to be revoked when the verdict was finalized; 6-that Ekrem BAYTAP (the defendant coming from İstanbul with the decision of rejection of venue) be sentenced to 12 years of prison by article no. 314/1 for “being a specially authorized director in an armed organization”. After the articles on penalty increase and reemission applied, without availing him of repentance law, the Court sentenced him to 15 years of prison, and finally decided to release him with regard to his previous jail time. - Article no. 58 of Turkish Penal Code no. 5237 need to be applied. Since the Court upheld the judgement for Ferhat ÖZMEN, our position of an intervening party ended. For that reason, in the stages following that reversal of decision, we could only follow the trial on file. This trial, opened in 2000 with the name of “ The Hope Trial Operation no. 2000/102 E.”, after passing through several stages, was approved by the decision no. 2006/1554 E.2006/6101 K. of Penal Department No. 9 of the Supreme Court on 8.11.2006. Following the Court’s upholding of the decision, the final verdict for Necdet Yüksel-judged as the perpetrator of the murder- had been finalized for Ferhat Özmen as well. The seemingly concluded trial is actually not finished for the relatives of Uğur MUMCU. As we stated in different stages of trial, sentencing Oğuz Demir -still could not found- judged Ferhat Özmen, Necdet Yüksel and other perpetrators should not mean that the case file could be closed. This file cannot be closed unless the real perpetrators behind the murder, not the ones presented to the society as the perpetrators, are revealed. It should not be closed. Since January 24, 1993, the day Uğur Mumcu was murdered, 12 governments, 14 Ministers of Internal Affairs, 12 Ministers of Justice and 4 Persecutors of State Security Court have changed in our country. Regrettably, however, Uğur Mumcu’s Murder could not have been clarified with all its connections yet. Although the Court upheld the final decision, we cannot regard the file as closed unless the instigators of murder come to light.